Mike Hardy. Thank you Mike. A few weeks ago, on the 29 April Mike, pictured above, died. His family and his wife Michele were with him and I think it was the end of a long, long journey for all of them. His death was not a surprise as Mike had suffered from Motor Neurone Disease for many years, but it is very very sad, and I cannot imagine how much his family must be missing him. At Mike's funeral, there was standing room only, he was such a memorable man and so many people cared for and about him. Mike's portrait above was painted for the A Graceful Death exhibition a couple of years ago, when Mike could still speak a little and could type on his computer keyboard. He was articulate and clever, speaking of his illness and how his life had changed without a shred of self pity. As an assistant head teacher it seemed his gift was to educate, and I have been taught much about life with MND by Mike and his wife Michele. Michele was his main carer. They were supported greatly by specialist nurses, carers and the MND society, but even so I only glimpsed the amount she did for him, and I was, and am, filled with deep admiration for her practical, articulate, consistent and loving approach to the life they both were faced with after the diagnosis of Motor Neurone Disease. Michele made no secret of how hard it was to look after Mike, and how frustrating the illness was for them all - an illness which must have take about thirteen years from the diagnosis to his death on Wednesday 29 April last month. I was first introduced to Mike through soul midwife and dear friend Mandy Preece, a volunteer on the Macmillan Unit in Christchurch, where for many years Mike attended the day centre. For his final few days, Mike was admitted into the ward at the unit, and was cared for by the staff who had been with him since the beginning, where Mandy too was able to say goodbye to him. 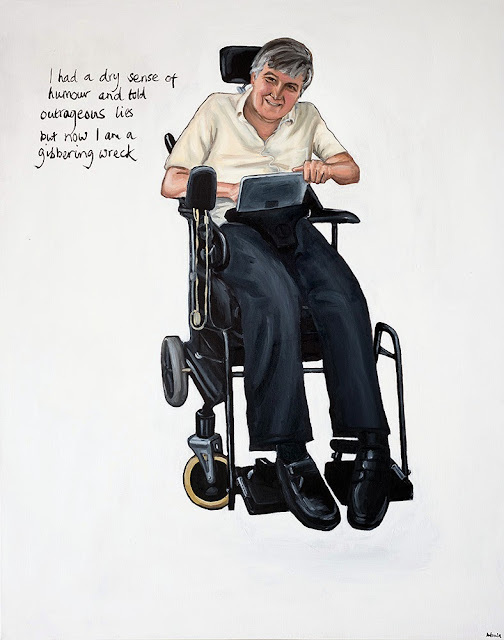 A few years ago, Mandy had arranged for me to meet Mike in the day centre, to talk about him being painted and interviewed as part of the A Graceful Death exhibition. She had spoken to him about it, and he seemed keen to be involved, and so Mandy called me and made a date for us to meet. I went along with no idea of what to expect - I knew Mike communicated through a computer keyboard, and could speak with difficulty, that he was wheelchair bound and that I had never met anyone with MND before. I wasn't sure if I was going to be able to communicate with him, and I was nervous. As I approached to say hello, Mike giggled and started to tap out a greeting. Instead of saying, "Hello Antonia, I'm Mike and nice to meet you, don't be nervous" he tapped out the text that I have painted onto his portrait - "I had a dry sense of humour and told outrageous lies but now I am a gibbering wreck." Everyone started to laugh, I was instantly at ease, and I was aware that no matter what I thought, Mike was in control, and was fully, totally, all there. One of the first things he taught me was that MND takes away your physical abilities, but doesn't take away your mind. He couldn't take part in conversations by speaking, but in his head he was replying, giving his opinions and being just the same as he always was, only no one could hear him. He also showed me that if you are going to speak with someone who uses a keyboard, and cannot speak, you need to take your time. We are so used to communicating quickly and moving on, we never think about long silences and how it must feel to take five minutes to say one thing. Mike showed me that I needed patience if he was saying something, to wait and to let him say it or write it, and not to interrupt needlessly. I really enjoyed meeting with and working with Mike and Michele, and I am grateful to them both for their wonderful contribution to the exhibition. 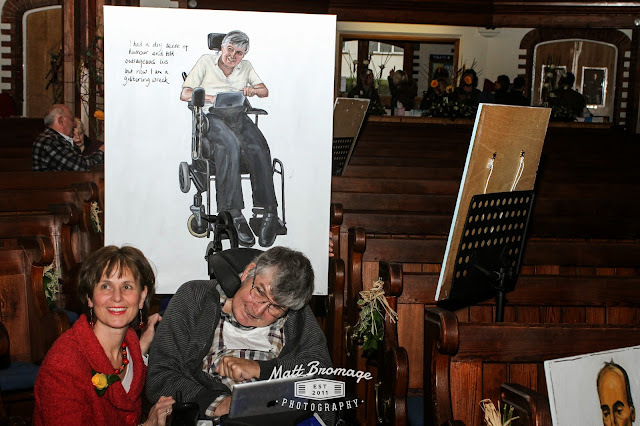 A few weeks before he died, Michele brought Mike to see A Graceful Death at Mandy Preece's event Dying to Know in Bounemouth. He took a long, long time to tap out on his keyboard "I've gone downhill a lot since I saw you". Michele is standing behind his portrait holding it up. I have been thinking recently, about what I do. There is something about working with the end of life that means that I work with life itself. 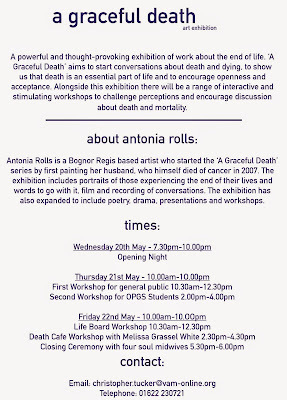 When I am asked to talk on A Graceful Death and soul midwifery, I am clear that I don't work with the dead and I don't work with after death. That is not my gift, I have friends who are fantastic in the work they do after death, my thing is working with the living. Until the moment of death, if required, but always with life. Because of this working with life, I have begun to listen and be aware that many of us who are not actively dying need soul midwifery just as much as those who are known to be palliatively ill.
"A soul midwife is a holistic therapeutic companion to the dying offering sound, colour therapies etc. to ease the dying journey. What we do is provide emotional support by sitting alongside and being with someone without agenda and being willing to listen to their fears"
I am some of that, but I don't offer sound, colour or therapy of any sort. I do the sitting alongside without agenda listening, and I do the being present and holding the space. Listening to what is not being said as much as what is being said, and giving all my attention and love to the moment, for however long that moment lasts. It used to confuse me that the most profound and best moments were just those, moments. I had imagined that to make any difference, I had to be with someone for hours. It didn't feel right otherwise, as if in order to be real, any breakthrough had to take ages and to be really difficult, or it didn't count. Sometimes that is the case, but mostly, the most enlightening moments are random, fleeting, and if you blink, you may miss them. They are moments of grace, and are sometimes deeply moving, sometimes painful, sometimes blissful. Sometimes they are all of those things. Yesterday, I accompanied a lady to visit her friend in hospital, who was slipping very gently away. The friend, according to his family, was not talking about what was happening, was not saying what he wanted, was not addressing this terrible situation. The person who I was to accompany, felt unable to help, and wanted support. But what I found when I entered the hospital room, was that this man did know what was happening, he was telling us in his own way, it was just that it was not in the way his distraught family could hear. He was speaking, but quietly, with half finished sentences, with insights and gentle regrets, about getting ready to go, about acceptance and about the sadness of not seeing his grandchildren grow up. What he was not doing was answering questions, or discussing his funeral, or helping his family feel better. We sat down with her friend, and once we had provided the space and the silence to hear him, and to give him the attention he needed, and to acknowledge what he was saying, he began to tell us about how he was coming to terms with his dying. Between us, we held his hands and listened to all that he was saying, and all that he was not saying and between us, we let him know we understood. This being understood, being given the space and the attention, is what we need in life, not just at the end of it. I have been considering, that being a soul midwife is a necessary thing for everyone, not just the dying. Being aware of our own mortality, really accepting that time will pass whatever we do, and this one life we have is ours to use and create and live, is so simple. It interests me that if someone focuses on us when we are talking, gives us the respectful attention we need when we are communicating, we feel valued, heard, supported and affirmed. Don't wait until someone is dying to offer this, do it now to whoever is with you. I think I will be a soul midwife to the well and living too. 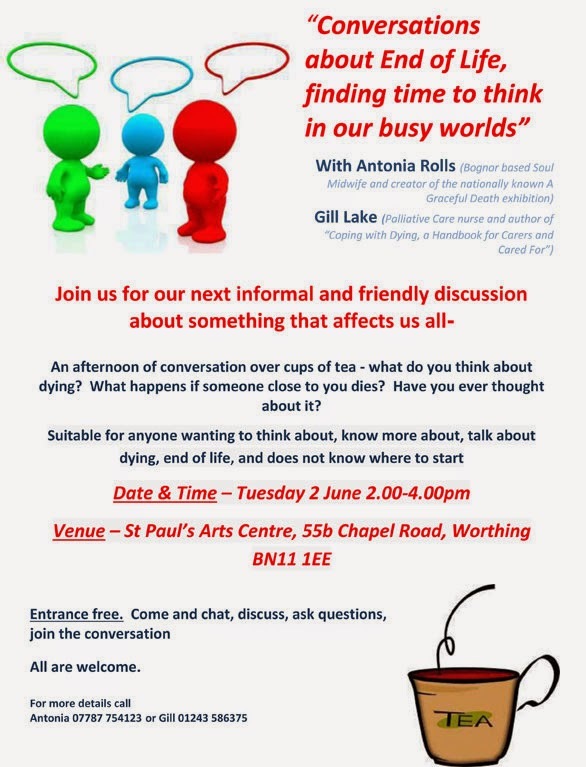 Conversations about the End of Life, Finding Time to Think in our Busy World is coming back to St Paul's Art Centre in Worthing next month, June. Free, and very interesting to see who comes along, and what we all talk about. 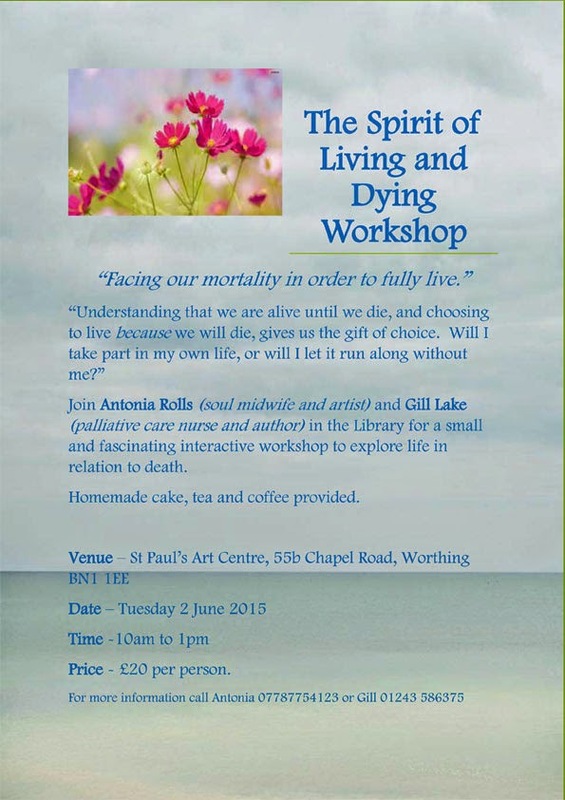 Spirit of Living and Dying Workshop also at St Pauls Art Centre in Worthing - an interactive, creative loving and challenging workshop where Gill Lake and I suggest that we recognise that facing the fact that we will all die gives us the impetus to live, really live. 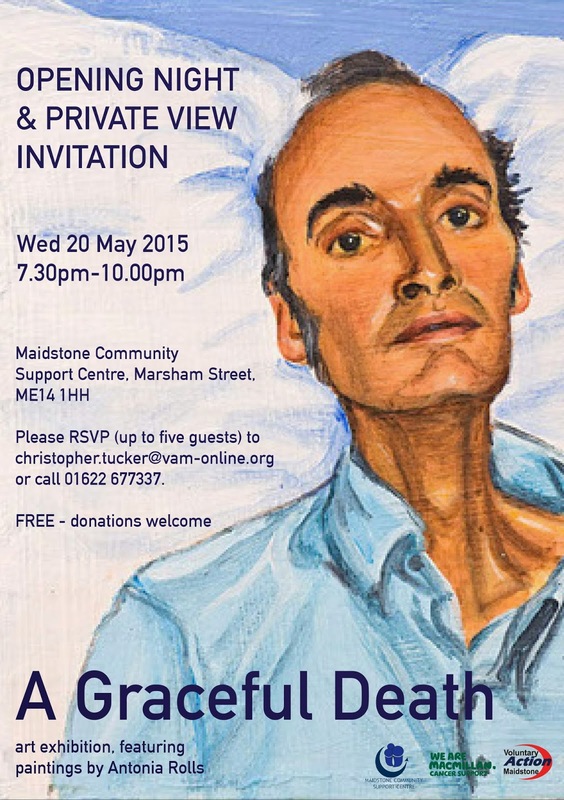 The date on this poster is wrong - it is now Wednesday 10 June so please do come, but on Wednesday 10 June. Wednesday 10 June. Not Tuesday 2 June. Still a very good workshop despite messing the dates up. Next showing in Maidstone in Kent for Macmillan Voluntary Services, as part of Dying Matters Awareness Week. I am really proud to be associated with such a wonderful organisation, and have deep admiration for the work they do. Jane Pantony from Voluntary Action Maidstone for Macmillan, is hosting this exhibition, and is also a trained soul midwife. 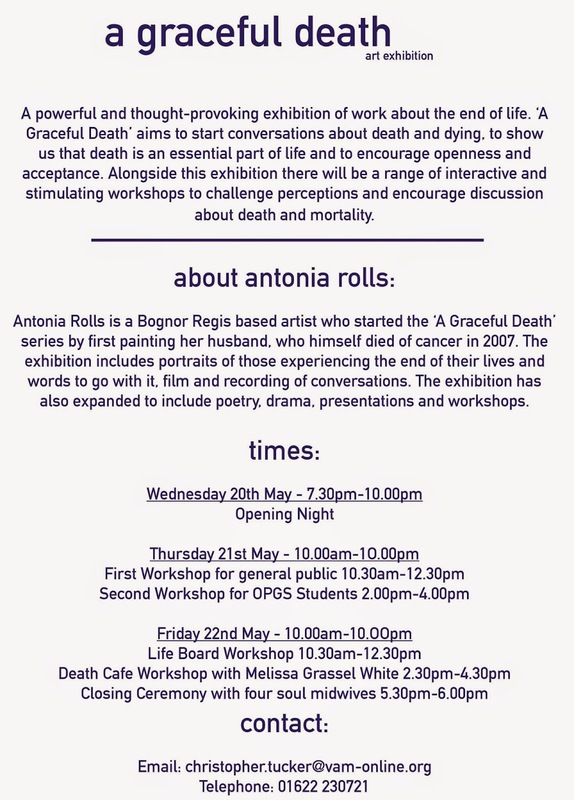 Soul midwife and friend Melissa Grassel White will be there for the exhibition to help, and is hosting a Cake and Death event, similar to a Death Cafe on the Friday afternoon. And my dear cousin Maddy is not only letting us stay with her (she lives nearby), but is coming to help too. Maddy is an experienced AGD helper, and is a very dedicated pain relief specialist and physiotherapist. The exhibition is free, and runs from Thursday 10 am to 10 pm, and Friday 10am to 6pm. As you can see there are workshops and talks, please come along and take part. My work as a commission artist has been ongoing, and when I am not doing other things, I still paint pictures that are not to do with end of life. I have painted a whole series of God's Life pictures which show rooms in God's house, just as God has left them for a moment. We get a glimpse into the room, and the clues around the room tell us what God has just been doing, and what surrounds God at leisure. Here are two latest paintings. Acrylic on canvas, and about 10" x 10". It may be difficult to see all the detail, as I still need to get a professional photograph taken of them. 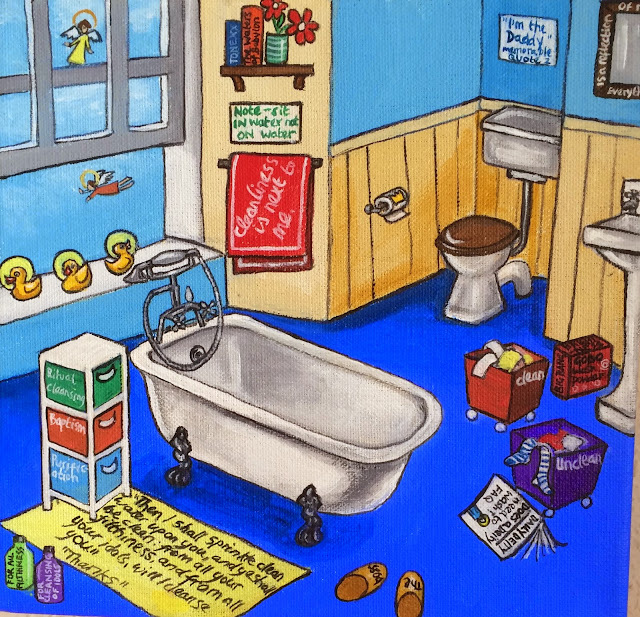 See what you make of God's Garden (note the dove cote and the lamb and the tree of knowledge) and God's Bathroom (note the bath towel, the laundry baskets and the mirror). The paintings carry on around the edges of the canvas, which is not visible here. I have added little quips and images around the sides which are only visible when you stand in front of it. 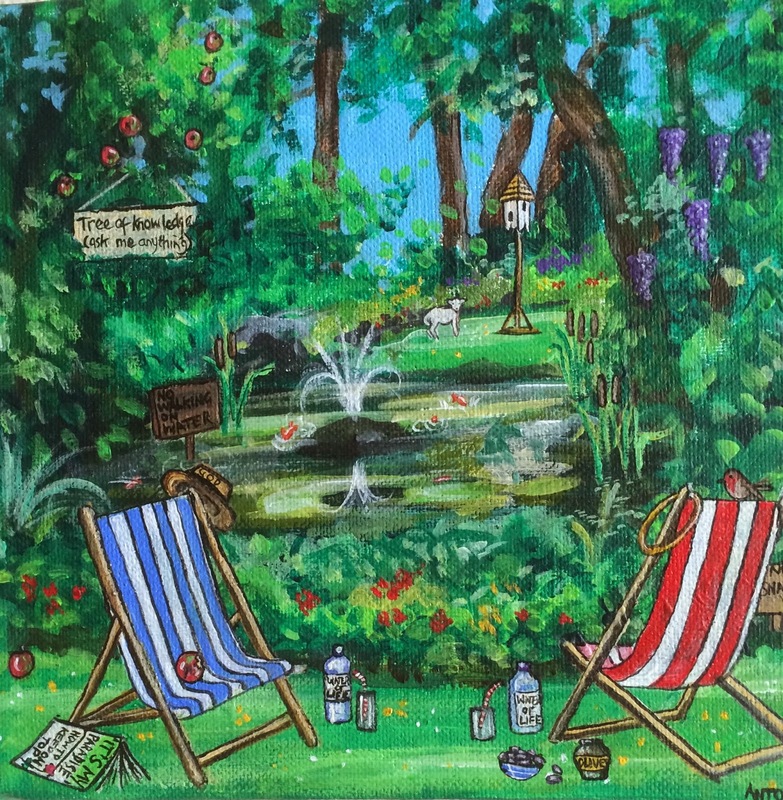 God's Garden, with an apple from the tree of knowledge half eaten on the deck chair. Note the crown on the loo paper. This was filmed in September 2013, for the A Graceful Death exhibition, and is a witty, insightful and truthful account of life with Motor Neurone Disease, for both the carer and the patient. RIP Mike and thank you.